You will find below the horoscope of Cristina Pavarotti with her interactive chart, an excerpt of her astrological portrait and her planetary dominants. Horoscopes having the same aspect Mercury conjunction Pluto (orb 0°16'): Whitney Houston, Sylvester Stallone, George W. Bush, River Phoenix, Claudia Schiffer, Nicole Richie, Charles Baudelaire, Steve Carell, Jenna Elfman, Laure Manaudou, Galileo Galilei, David Hasselhoff... Find all the celebrities having this aspect. Horoscopes having the same aspect Venus trine Saturn (orb 0°25'): Leonardo DiCaprio, Marine Le Pen, Halle Berry, Khloe Kardashian, Tina Turner, Dave Gahan, Yannick Noah, Manuel Valls, Ricky Martin, Sarah Michelle Gellar, Joan of Arc, Vivien Leigh... Find all the celebrities having this aspect. Celebrities clicked on in real-time: 576,035,903 times. Here are some character traits from Cristina Pavarotti's birth chart. This description is far from being comprehensive but it can shed light on his/her personality, which is still interesting for professional astrologers or astrology lovers. 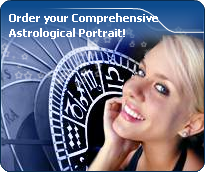 In a matter of minutes, you can get at your email address your astrological portrait (approximately 32 pages), a much more comprehensive report than this portrait of Cristina Pavarotti. Cristina Pavarotti, the diurnal South-western quadrant, consisting of the 7th, 8th and 9th houses, prevails in your chart: this sector brings about a thirst for communication and sometimes, a need to take risks in your dealings with others. Relations are a factor of your evolution and your transformation, which you accept serenely. Indeed, what matters to you is the movement and the energy that link you to others and that make you gain more awareness. A kind of rebellion or a desire to get away from it all is rooted in you. Cristina Pavarotti, Fire is dominant in your natal chart and endows you with intuition, energy, courage, self-confidence, and enthusiasm! You are inclined to be passionate, you assert your willpower, you move forward, and come hell or high water, you achieve your dreams and your goals. The relative weakness of this element is the difficulty to step back or a kind of boldness that may prompt you to do foolish things. Like the majority of Earth signs, Cristina Pavarotti, you are efficient, concrete and not too emotional. What matters to you is what you see: you judge the tree by its fruits. Your ideas keep changing, words disappear, but actions and their consequences are visible and remain. Express your sensitivity, even if it means revealing your vulnerability. Emotions, energy and communication must not be neglected; concrete action is meaningless if it is not justified by your heart, your intellect or your enthusiasm. Your angular houses, namely, the 1st, 4th, 7th and 10th houses, are very emphasized in your chart, Cristina Pavarotti: according to the Tradition, they are the strongest and most dynamic houses. Should the rest of your chart concur, angular houses suggest that you are an enterprising, energetic and assertive woman. Indeed, angular houses are said to generate impulsions and to give a powerful and domineering personality. After this paragraph about dominant planets, of Cristina Pavarotti, here are the character traits that you must read more carefully than the previous texts since they are very specific: the texts about dominant planets only give background information about the personality and remain quite general: they emphasize or, on the contrary, mitigate different particularities or facets of a personality. A human being is a complex whole and only bodies of texts can attempt to successfully figure out all the finer points. You are sensitive, vulnerable and tender at the same time, Cristina Pavarotti. When you love, you give your entire affection and your partner may in all confidence rely on a long-lasting and reassuring relationship. You are so calm and so tender that you think that it is enough to win over your partner's heart, and you are often right. However, do not mix up giving and receiving. You so deeply need to receive love in return that you may be too passive and in the long run, as you become demanding, you may show immaturity. Security and sustainability in your relationship are of utmost importance. Your family also is important, it is the refuge, even the sanctuary, where you like you hide when things go awry. You also dream of love, may be too much, and it may be detrimental to what might be concretely experienced if you were more dynamic or less fearful to get hurt. However, remember that you receive only as much as you give. The ruler of the Ascendant, Cristina Pavarotti, is Uranus. In the sign of Virgo, it turns you into a cautious and rational person, sometimes to the detriment of your feelings. You like to improve yourself, and you pay a great deal of attention to details. You respect the rules, and you appreciate well-done work. However, you may lack self-confidence or you may hesitate, perhaps because you hate to make mistakes, since you believe that truth is a major quality. It is difficult to find a more sensitive person than you, Cristina Pavarotti. You are able to contain your aggressiveness and it may be hard for you to exteriorize your feelings. You are usually passive and you draw your strength from inertia and resistance more than from the will to take action. Your mood is changing, you show little of yourself and you may surprise with your inopportune reactions that come late, when people have forgotten what it was all about. The only area where you express yourself with zeal and where your actions are successful is the area of home or, more symbolically, in the fields where you can achieve security. In other words, you need to feel comfortable before you can move, in concrete matters as well as in sexuality. This text is only an excerpt from of Cristina Pavarotti's portrait. We hope that it will arouse your curiosity, and that it will prompt you to deepen your knowledge of astrology, as well as to visit and use the wide range of free applications at www.astrotheme.com. Your Life Path is influenced par the number 9, Cristina, the path of travel and transcendence. You know how to take a new look at yourself and how to broaden your horizon. You are driven by the thirst for achievements and you cultivate the sense of the sacred and of sacrifice. Life teaches you to constantly push further the limits of your ego. Your destiny is based on altruism and devotion. You are very generous and you always listen to people's needs, which is among the reasons why you are very much sought after. You also show little interest in socializing or social futilities. Your spiritual growth means much more than worldly frivolities, even though it means that you have a hard time remaining grounded when you experience difficult circumstances! Your Life Path prompts you to learn, to increase the number of enriching experiences, and to constantly progress. You are interested in intellectual matters, and you set yourself high objectives. Meditation and contemplation are your valuable assets.